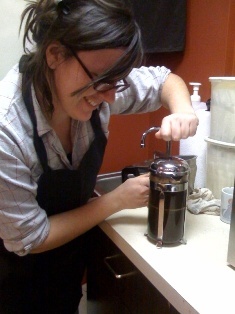 We are so psyched to see how many of our customers are now brewing their Tazza D’Oro coffee in a French Press. Over Thanksgiving, I gave a demonstration at my mom’s house to about 20 people gathered in her kitchen. Emily told me a story of doing the same for a room full of friends and Amelia called from NJ saying she was doing the same with her family. I love the experience and culture that coffee helps create! A few fellow french pressers have asked how to make their coffee taste exactly like it does at Tazza D’Oro. Take a look at these directions and if you need more help just stop in – ok? There are probably a gazillion different directions you could find on the internet, but the directions below are what we do at Tazza D’Oro because we think it works best with our coffee and our taste preferences. 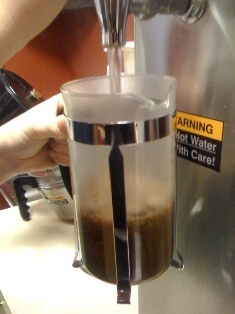 Make sure your grinder and French Press are clean and use fresh beans and cold, filtered water. 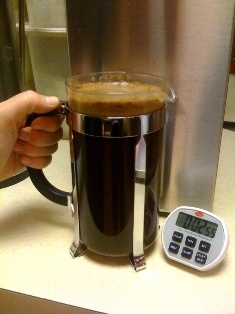 Use 2 Tablespoons of whole beans per every 6 oz of water (10 Tbl for a 30 oz French Press). 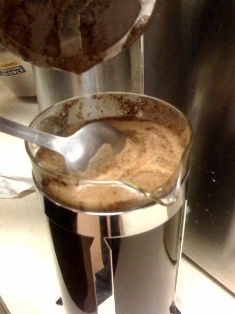 We use a little bit of a courser grind – the ground coffee looks a bit smaller than sugar in the raw. 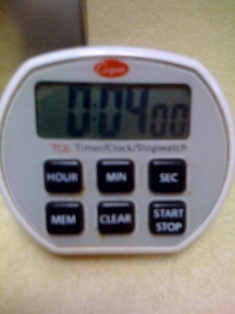 Most customers tell us their grinder works by holding a button on the lid. For these types of grinders I say grind the beans for 10-12 seconds. Enjoy your tazza d’oro (cup of gold)! 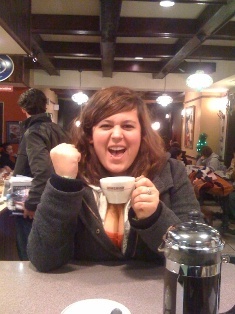 BTW, our customer, Fawn is demonstrating our Tazza D’Oro “YEEEAAAHH”! 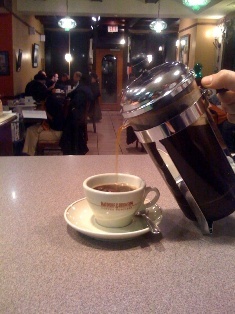 Have you tried skimming the grounds off of the french press ala cupping style? 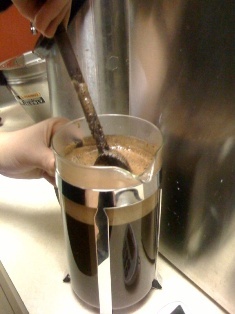 I hadn't heard of it until I saw James Hoffman's video on french press brewing http://www.jimseven.com/2008/11/13/french-press-technique/ I haven't tried it yet but would be interested to see if it gets rid of some of the sludge. This is really great, nice job. great material here! the photos are good and instructions clear. in response to Jake, skimming produces a very clean cup with less of the press pot oiliness, much less sediment and mess, and it's easier plunge. the result is somewhere between drip and press in body and oils. 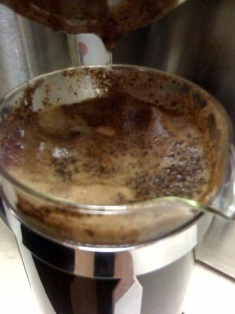 those of you who love heavy-bodied press pot coffee in all of its oily greatness should proceed without skimming.